Speedvagen bicycles are purpose-built in limited runs. That means you get the benefit of a full custom process from fit to finish, combined with the radness of not having to wait forever for your fully custom bike to show up. Our tubing is made up of the strongest alloys from True Temper and Columbus. The stronger the alloy is, the thinner it can be drawn and remain strong. The thinner the tubing the lighter it is. When you go thin and light, you also need to make the diameter of the tube larger to keep the frame stiff. 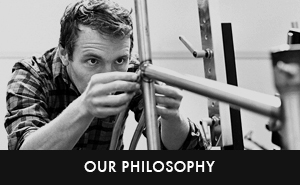 Look at one of our frames; you’ll see larger diameters up at the headtube to deal with the twisting forces and smaller diameter at the seat tube / top tube joint; a place that you want a little cush. The down tube is bi-axially ovalized (fancy words for ovals being oriented at 90 degrees to each other) because you have vertical force up at the headtube and side to side force where the downtube meets the bottom bracket. 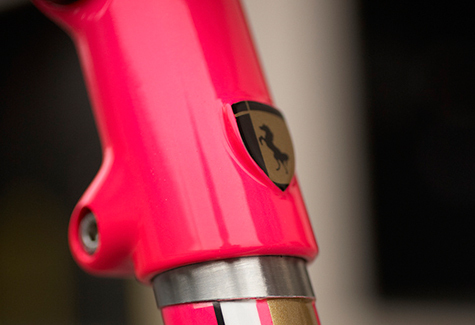 We promise this isn't a copout: the seatstays have too much going on to get into. They are crazy difficult to make compared to the stock offerings. They’re a big contributor to the ride quality of a Speedvagen, and that makes it all worthwhile. Each tube is selected and shaped specifically for it’s owner and based on the size of the bike. We do this in-house for an even ratio of strength, suppleness and sexualissimo. A typical brake bridge between the seatstays has a painted face where the brake mounts. On every bike in the world, the paint gets squeezed out when the brake is bolted on and that paint eventually falls off of the frame leaving bare metal to rust. We like to use Stainless steel in high wear and tear areas and this spot fits the bill. We took cues from our Berzerker dropout with the removable brushed metal face. The inside of the bridge has been machined out, turning the chunk of metal into what is essentially a very light tube. The bridge tapers to a larger diameter where it attaches to the stays, creating a stiffer joint. This results in less flex and better braking. This new generation of dropout is our lightest and smartest to date. The Berzerker dropout is cast from a super strong steel alloy and incorporates stainless steel inner and outer faces. The use of dual materials means that we get the strength of the base metal and the protection from wear and tear that the raw stainless offers. The design is all business. 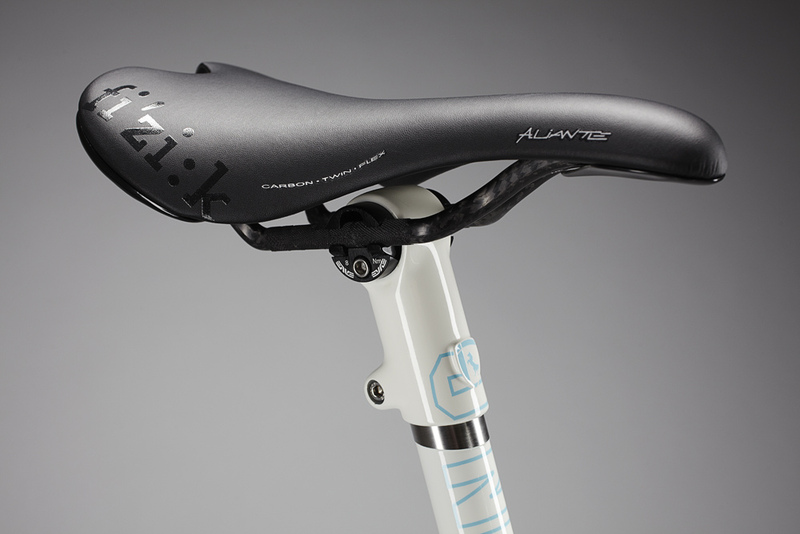 An integrated seat mast makes for beautiful lines. A couple of things that are unique to our bikes: The length of every Speedvagen seat mast is finished specifically for it’s owner. We use stainless steel around the top of the seat tube where our post head mounts, rather than the post head wearing on a painted surface. The result is lighter, and cleaner, than a traditional seat post and collar and looks great topped off with our ENVE-made Speedvagen post head. Lighten it up with the ENVE carbon fiber seat tube upgrade and you could be defending your machine to the UCI. We’ve worked with ENVE Composites to develop a Speedvagen-specific, externally clamping post. 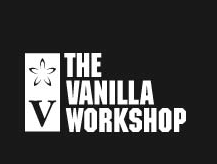 The new design has zero setback and has more vertical adjustment. At 90 grams, it’s half the weight of our original design. This item will be painted to match your frame and will feature a 3-dimensional Speedvagen shield on the front. out the ride and offer a weight savings of between 1/3 and 1/2 pound depending on frame size. We have offered the PRO Stealth Evo bar/stem combo as an upgrade option on our road bikes for a few years now. We like them for their shape and stiffness to strength ratio. They also look super sharp painted up to match your frame set. The broad tops offer a good amount of color integration. We offer the full range of stem lengths and bar widths. Around 40% of SV riders have us build their bikes with Shimano’s Di2, Ui2 and Campagnolo EPS electronic groups. This system eliminates standard shift cable routing braze-ons and routes the wires through the frame’s tubing, rather than outside of the tube. Integrating the wiring harness into your frame adds considerable fabrication time and proprietary fittings, but the result is visual cleanliness and precise function. Routing the wires internally is one thing, but up until now we’ve used Shimano’s traditional battery and junction box which are bolted on (like a water bottle cage) to the underside of the down tube. 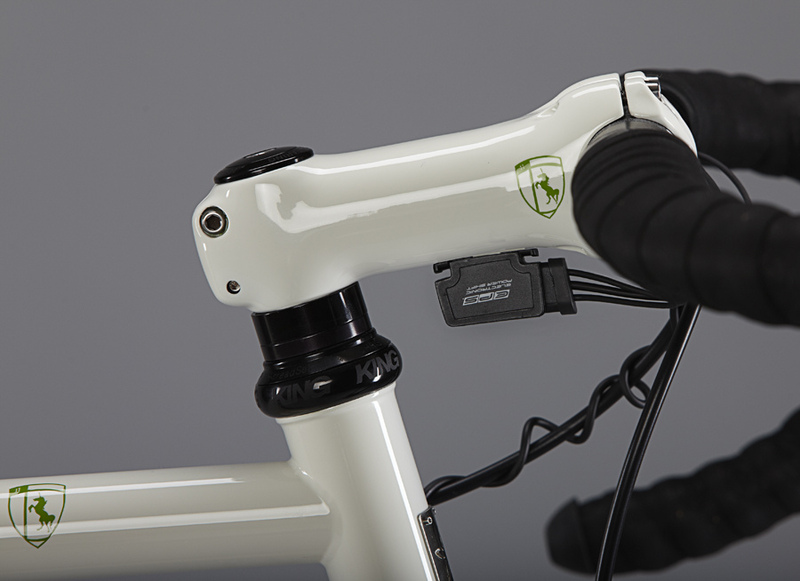 We’ve released our own integrated battery system, which affixes the battery neatly inside the top of the seatmast under the seatpost head. The system is beautifully designed, weatherproof and requires no tools for installation or removal of the battery for charging; a pleasure to use.